Available to installers who wish to become experts in firestopping cable penetrations and to contractors who wish to receive discounts on selected UNIQUE Fire Stop products. The training and testing is the same for both installers and contractors. 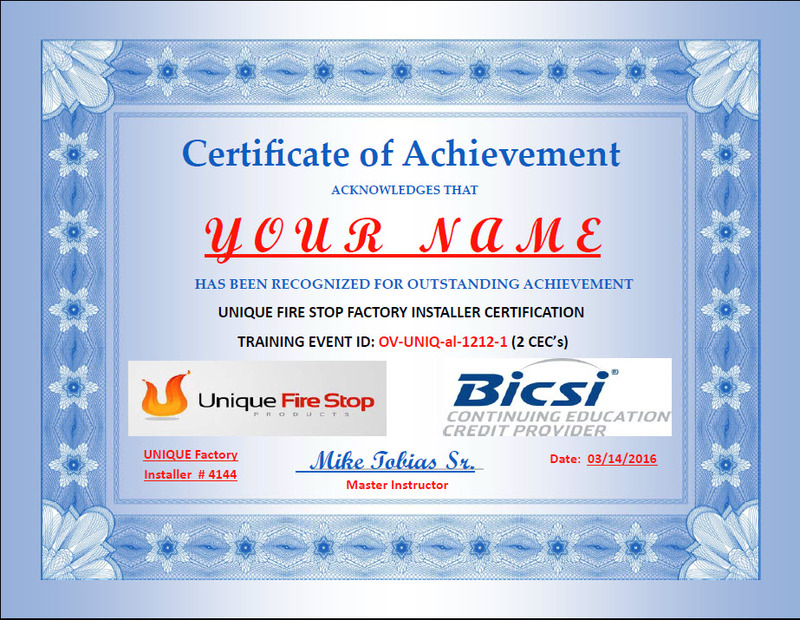 To become a UNIQUE Fire Stop Factory Installer or UNIQUE Certified Contractor, you must be employed by either a company in the cable installation business, a firestop contractor, an engineer, an architect, or wire and cable distributor. Only one company may be listed on our Map of Certified Installers in each city. We are no longer able to process tests for trade schools or technical colleges due to the volume. Class Instructors may be approved to conduct the class. Please contact the factory. 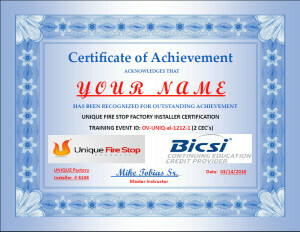 You will receive a Registered UNIQUE Fire Stop Factory Installer Certificate in your name and 2 BICSI CECs. You will be listed on our website Map of Certified Installers, upon request, with links to your company website and your email. You will be referred work in your area as end users need our products installed by a factory trained technician. Your company may buy direct and will qualify for Contractor Pricing. Only one company listing per city gives you a marketing advantage. DO NOT TRY TO TAKE THIS TRAINING ON A CELL PHONE. Note: If at any time you have questions on this self-administered online training and testing program, please call or email Mike Tobias. We HIGHLY recommend you print and use the Study Guide/Practice Test to record your answers before you submit your official test for grading. Discover the answers for the Study Guide/Practice Test using the website as you would an open book test. Most of the answers will be found on the description page of each product called for in the different scenarios. Click here for printable version of the Study Guide/Practice Test. Be sure to include your employer’s information to be added to the Map of Certified Installers. You must pass with a 100% score to qualify for UNIQUE Certification. This process works best on a desktop computer. NO cell phones. It is too graphic-intensive for a cell phone. Click here to copy your answers from the Study Guide/Practice Test onto the Official Test Form and submit for grading.